Friday the 13th Better Not Mess With Me! Lately, I’ve been pretty quiet on the Internet (well, for me) because three days ago my Grandma had a mini-stroke. This happened a day after my cousin was caught in a Houston flash flood and escaped from her car by climbing out the window. 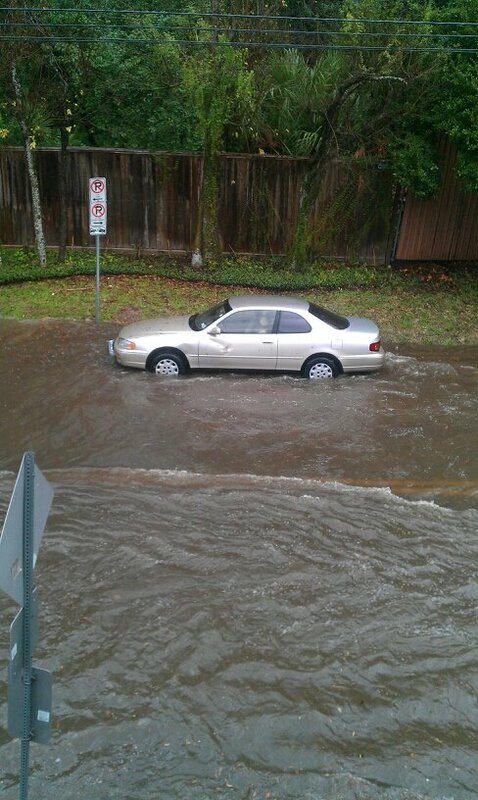 According to my cousin, the water had receded a foot before she took this picture. That was after she helped rescue someone else from their car and then helped a third stranger push his car three blocks to safety. In heels. On the plus side, I think this counts as superhero training. In the downside, her car was totaled. Although I think she’s mainly annoyed that she ruined her favorite pair of heels. My cousin is kind of a nut that way. So I was feeling very grateful that my cousin hadn’t fallen down a manhole (which sounds funny, but really isn’t. I’m so glad she made it out okay) when my grandma called from Palm Springs saying that she had a mini-stroke at 2am. of course, my grandma also decided she could go back to sleep and call us in the morning. She’s that kind of 83 year old woman. So my brother instantly drove out to Palm Springs so that she could be treated by her doctors in LA while I sat uselessly around the house. Occasionally I cleaned. Mostly I berated myself for my lack of driving skills. Then two days ago we got the results back from the doctor and instead of showing one mini-stroke like she expected, it showed two of them. The doctor then pointed out that her carotid artery was over 80% clogged and that she needed immediate surgery. Did I mention that the power (and the Internet) went off that day? Because that happened too. So we were quite literally in the dark while we tried to figure out how quickly we could schedule my grandma’s surgery. Thank goodness my aunt flew out to LA immediately. I am so incredibly glad that she’s taking charge of the situation. She’s absolutely brilliant in times of crisis. So this morning at 4:45am the three of us left for the hospital and now my grandma is officially in surgery. Since I wasn’t able to sleep until 2am, I’m more than a little tired. But the coffee is helping and I think we only have another two hours of waiting to go. But Friday the 13th better not try to mess with my family. Not today. My grandma having a great time in Africa a few weeks ago.